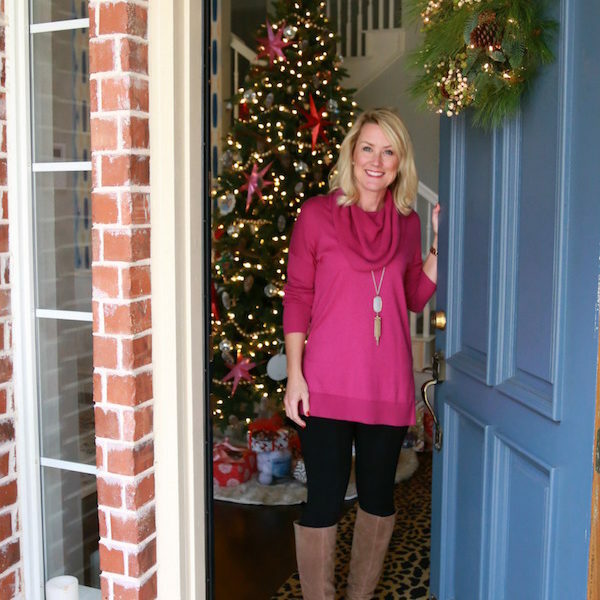 Another Mirror Makeover (& a Giveaway!) | hi Sugarplum! Hello, hello! How was your weekend? My birthday weekend was divine! I was smothered with love, attention, affection and food! Well, I wasn’t literally smothered in food, but I ate a lot of it. And thank you for all the sweet birthday wishes…even though we’re virtual stalkers of each other, it still made my day! Today I get to give you a BIG present! When the cool people of MirrorMate contacted me to see if I’d like to try their product, I hesitated since none of my bathroom mirrors are in need of a frame. 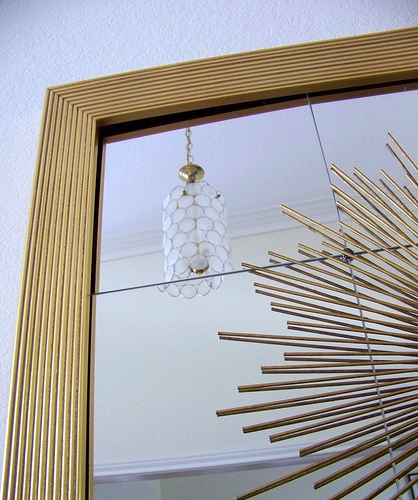 But then I got to thinking of other ways to use their clever framing system, and decided the DIY Mirror in the Entrance Hall was ready for an upgrade! After browsing their selection online, I decided on the Portage 18K gold. Since Liberace has taken residence here, I figured I’d appease him. The frame arrives in four separate pieces, and is fairly simple to assemble…only it’s a 2-man job because you need the extra set of hands. Once you’ve glued and clamped the four corners together (or had your hubby do it), pay extra special attention to the directions on how you adhere it to the mirror. The sticky strips are strong enough to keep Kim and Kris together. If you have an eagle-eye, you’ll notice our frame is a smidgen crooked…but it’s not coming off now, so I guess I’ll have to stop nagging get over it. I may have added the sunburst mirror to make the larger mirror more visible, but I’m leaving it because I love the extra layer it adds. 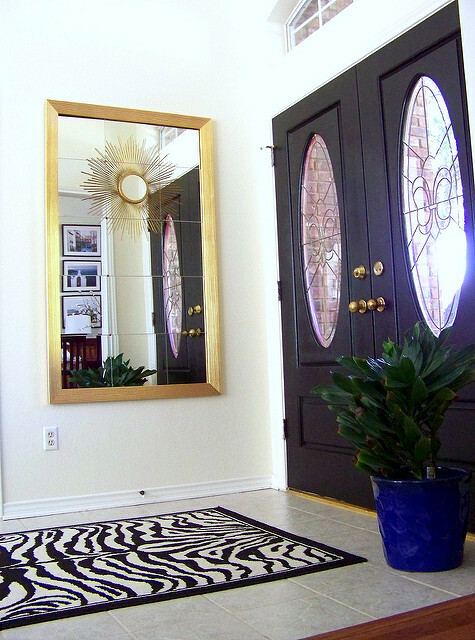 I love how the golds in the door knobs, light and mirror tie everything together. One of the corners keeps popping off the mirror, but I think that’s more about wonky walls, and less about the frame. I’m really happy, and surprised, at the high-end quality of the wood frame. Mine is a hefty 3′ x 5′, but still lightweight. The nailhead trim is subtle, but I’m crazy about the added accent. Framing the mirror tiles really defines it. Before it sometimes just looked like a reflection on the wall. Now the Entrance Hall has more of a presence. Since there is no room for an entry table, the wall is the only place to accessorize the space. So here’s where the gift for you comes in…. $200 credit towards the cost of a frame! UPDATE: This giveaway now closed. Random.org chose Aubrey as the winner! you can get 15% off your order until December 10! OHMYGOSH… I've been wanting something like this forever, to put around a mirror in my bathroom. How exciting! that looks AWESOME! wow the gold is perfect! 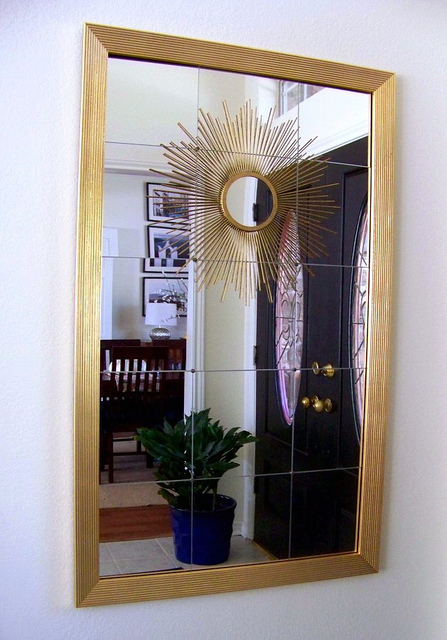 and the house we moved into has those lovely builder grade mirrors, so i would love to win this! 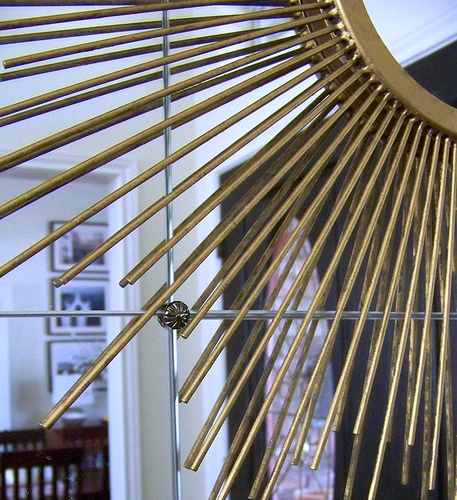 The gold frame looks wonderful and really enhances the sunburst mirror! Love the gold! I could swear that Liberace was living with me?! I need a large frame like this for the kids bathroom. I would LOVE to win this. Our master bathroom needs a frame so bad (and the uncut molding in our garage that's supposed to be for this project doesn't seem to be putting itself up). Love the mirror update girl!! Gotta say the gold makes is fabulous!! I would use it to frame the mirror in my guest bathroom. I would love to put one of these frames on the bathroom mirror. Thanks for the chance to win! Just started following your blog..love it! LOVE it! It makes such a statement now. I've been bitten by the gold bug too! Me and my gold spray paint are going to town. Love the updated mirror look, thanks for sharing. 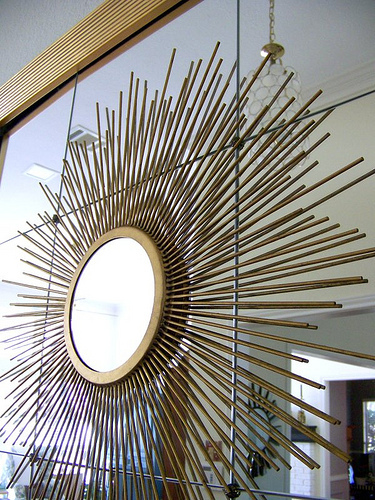 I would use them to make a full length mirror for my bedroom, great giveaway! I would love this to start framing my bathroom mirrors! That looks so good Cassie!! Pick me pick me! I'd probably use it in the nursery. 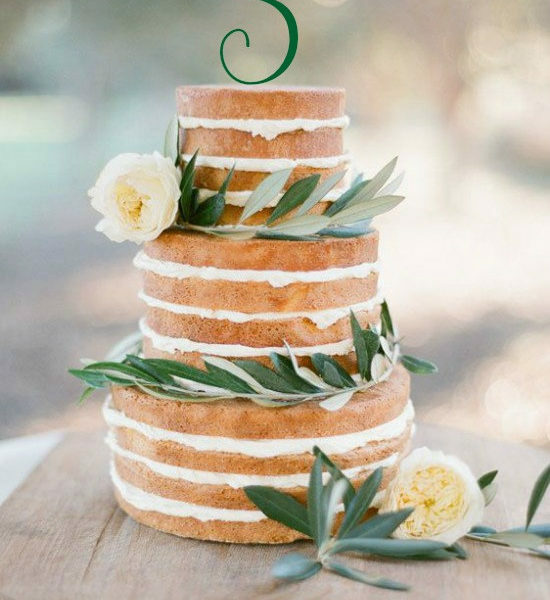 You've added the icing on the cake!! It looks so good and makes the entrance(or exit) really pop! It looks perfect, so much more pulled together. I would love to use it in my bathroom! I am a follower and I desperatly need this! Our Master Bathroom mirror needs a frame! The guys who painted our bathroom put up an 80's style frame that was complete crap and even fell off! So our mirror looks aweful! I desperately need a frame for my master bath mirror! I'm crossing my fingers that I win this one!! This is so easy! 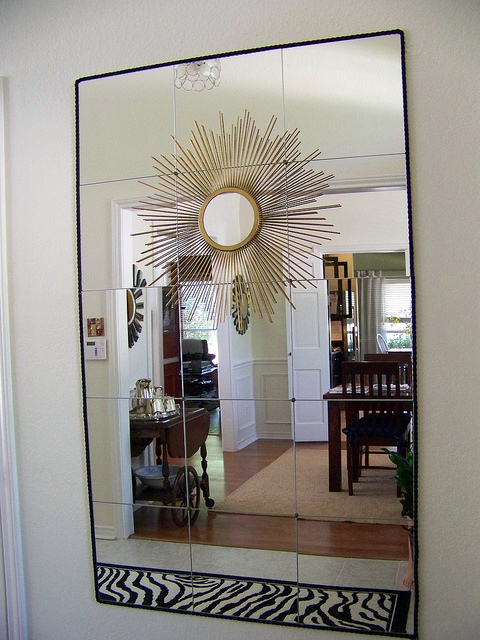 I would use it in our master bath to update the ugly builder grade mirror. I have been planning a master bath makeover and this just might give me the push I need to get started! I "liked" MirrorMate on FB! Wow! Your mirror looks amazing. I could totally use a frame in our builders grade master bath. It really needs a frame that would make that bathroom pop! Cass, it looks really good. It made such a big difference. I could totally hook my bathroom mirror up with Mirror Mate. I would love that! I would totally use the product in either our guest bathroom or master bathroom – both have builder grade mirrors. PICK ME!!!!! What a great transformation! I removed the builder mirror in our guest bath re-do and have been dying to frame it out and repurpose it into a floor mirror – this would be perfect! Thanks for the giveaway! Hi! 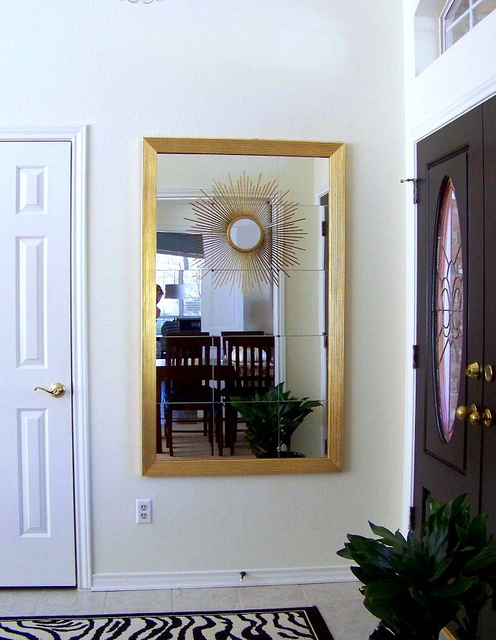 We just moved into our new house and I have been thinking of adding a frame to dress up our builder basic mirror. I've been going back and forth thinking about using this on our bathroom mirrors. Thanks for the chance! Definitely will use for our bathroom mirror, this would make such a difference. Ohhh I love the gold frame! It does pull everything together so nicely. I would love to put a frame around the mirror in my maste bathroom! Thanks for the awesome giveaway. master bathroom! I can't find any moulding at Home Depot/Menards that I like to DIY this, so to win would be wonderfuL! Gold was definitely the right choice. It looks stunning. 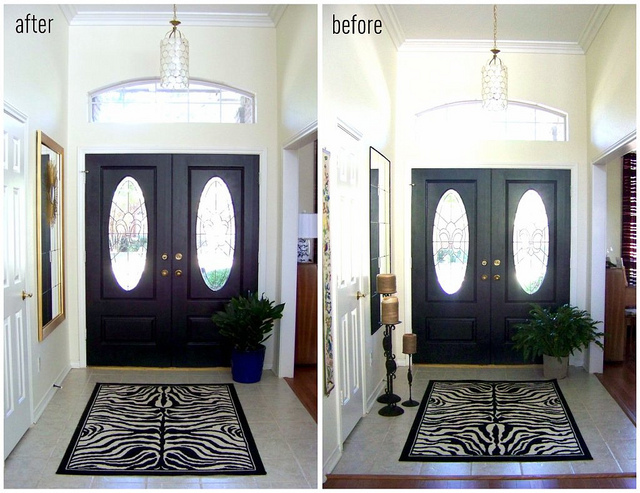 The black doors make such an impact in the entryway. I just moved into a new home and our master ensuite has a huge mirror crying for a frame. I would definetly use it to frame a frameless full length mirror I have on a divider wall between our master bath and master closet. This couldnt be anymore perfect (if i win…hehe). I would use a MirrorMate for my guest bathroom frameless mirror! I am in the middle of a reno and this is definitely on the list! I like MirrorMate of FB! I liked your site on Facebook…I'm following you on Pinterest. 🙂 Fingers crossed that I win…I hope I win 🙂 I'd love a new mirror/mirror makeover! btw- your mirror looks GREAT!! I need to do this for my bathroom mirror! I love the gold frame you used! We've got a boring builder-grade mirror in the kids' bathroom and I'd love to add a frame to it! That room needs work!! Tahnks for the chance! I could definitely use this in my master bath! Thanks for the chance to win! I would use it in my boys' bathroom, which has a huge mirror, but no personality! I would frame out our master bathroom mirror. We have 3 bathrooms and none of them have framed mirrors. It's driving me crazy! I would love to do a huge mirror in our stair well! I would totally upgrade my master bath mirror. This would totally look great in my bathroom! I'm already a subscriber..I would use this in my bathroom for sure! My bathroom is crying out for a mirrormate frame! I liked Hi SugarPlum on facebook! I liked MirrorMates on facebook! I could really use a MirrorMates frame to sort out the nasty bathroom in our rental condo. 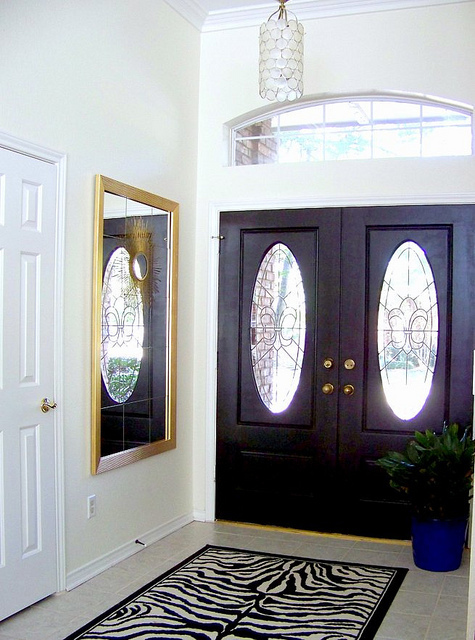 I love the gold frame you picked for your entryway. I am a follower! I woudl use this in my guest bathroom- been looking for a way to frame that mirror! I would definately use it in our master bath – it's in desparate need of a makeover! I have been puzzling over how to re-frame my bathroom mirror without it looking super cheesy. This just might be the way to go! So cool! You did a bang-up job. 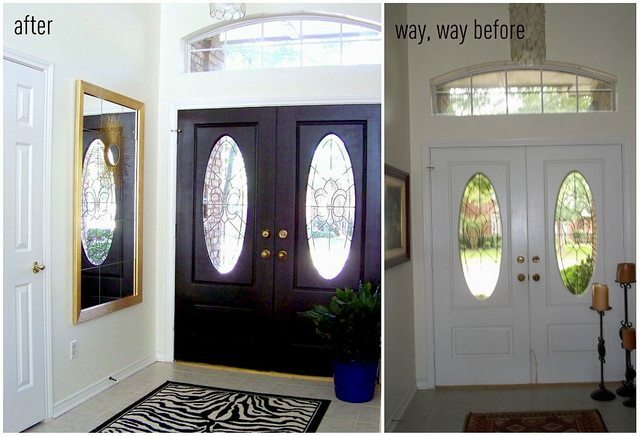 Would love to give it a try in my foyer! I would LOve Love LOVE! a frame around my LOOOOOOOONG bathroom mirror! 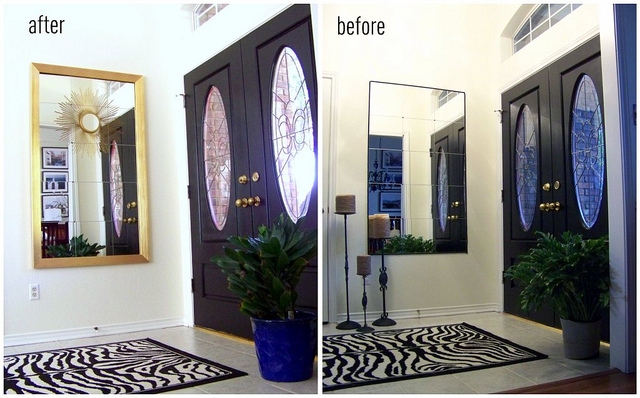 I love the mirror makeover! I could frame the mirror in my closet if I won! I would love to frame my mirror in our master bath. pinterest? love following you! check. I'd love to frame out our downstairs bath- it's so close to classy! 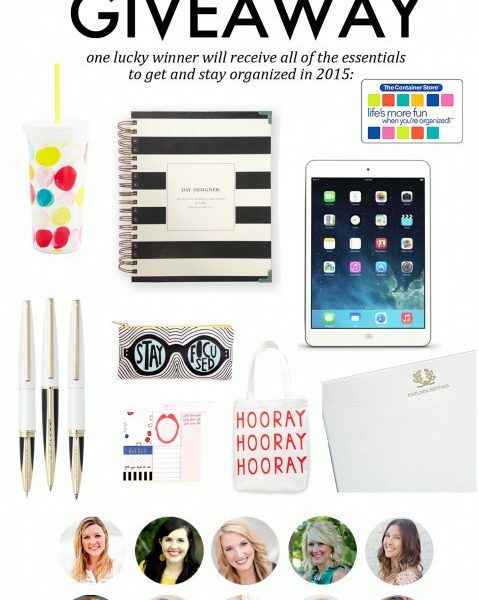 and I also liked mirror mate on fb- it's a good reminder to stay motivated and keep decorating! The builder-grade mirrors in my master bathroom could definitely use a little love from MirrorMate! 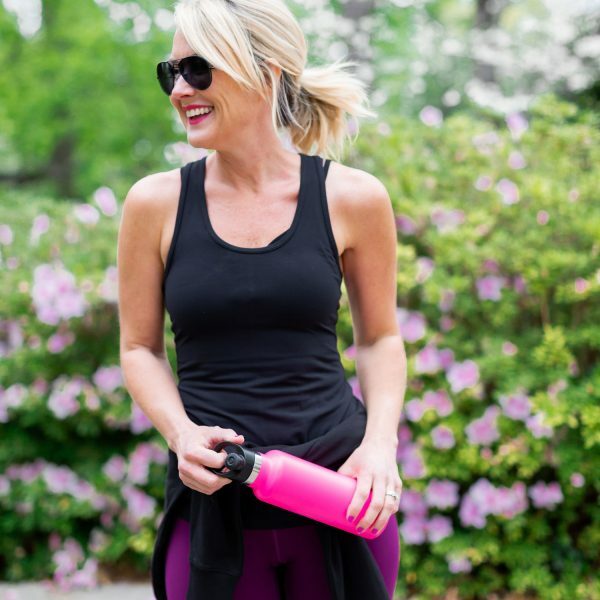 I like Hi SugarPlum on Facebook! 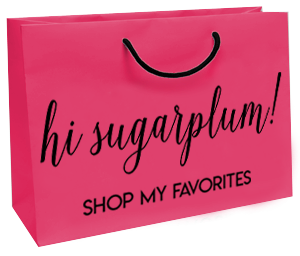 I'm following Hi Sugarplum on Pinterest and Twitter! I liked MirrorMate on Facebook! I am redoing our master bath right now ans this would help me so much! I like Hi Sugarplum! on Facebook. i would use this in my bathroom. my fiance would looove this!!! i promoted this contest on twitter (au_says) !! my fiance would love this!!!! Our bathroom needs something like this desperately! I have two bathrooms with builder mirrors that could really use a treatment like this. Love it! I need this sooo bad! Just moved into a house with two ugly bathroom mirrors! I'd get the antiqued bronze! I like Mirror Mate on facebook! I would use the credit for my master bathroom mirrors. I've wanted to install frames around these mirrors since we moved in 3 years ago. I would use the frame on my bathroom mirrors. I liked Mirror Mate on fb! I would use MirrorMate in our hall bath. When the painters came, I did not know they would take down the ugly attached mirror when they painted. By the time I realized it, it was too late to buy a new pretty one. I would dress-up that old one in a heartbeat! I like MirrorMate on facebook! I need a new frame for my bathroom mirror. I never win anything….please prove me wrong. I would love this for my bathroom mirrors. I have two big mirrors that both need a frame. Sure hope I win! I have these huge mirrors in my bathrooms that need something like this to make them bearable. I have been nagging DH for years to do something with them as he is the handy one. I need this for my daughter's room. What a great product. Hi Sugarplum- I'd love to win the MirrorMate contest to redo our bath for my Wife-she'd be so happy. Best wishes from Coastal North Carolina! 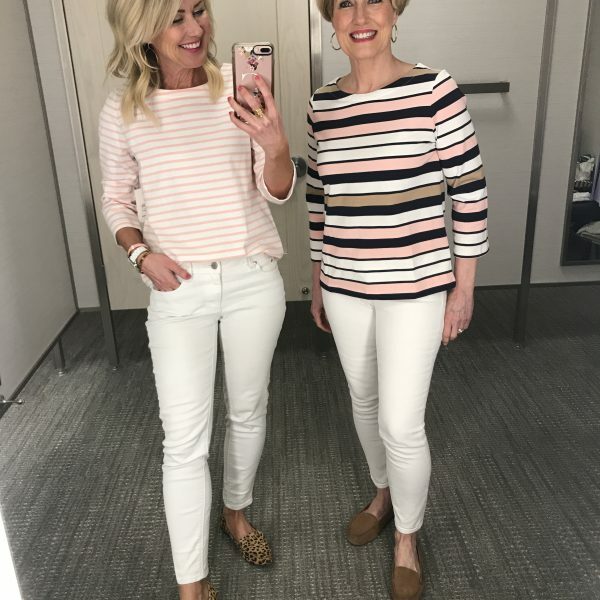 I would love to start framing our bathroom mirrors!